If you have a job you’re probably facing time management issues just like the rest of us out here. No matter if you have your family to take care of in the rest of your time or if you have a side thing that you love doing, there never seems to be enough time to do all the things you want to do. While that might actually be true, there are ways to make your free time work to your advantage. And by ways I mean time management strategies that you can apply to your schedule. First up, if you really want to make things work, you’re going to have to take a proactive attitude and stop just letting things happen to you. For example, you can start off by reading articles on time management and applying the stuff you learn there. See what fits you and your specific schedule and stick to those things. Then again, efficient time management is a work of trial and error. That means you’re not going to get it right on your first try. Try again. Fail again. Fail better. That’s what Beckett said. So, go ahead and try stuff. Invent your own system. Use apps, timetables, timesheets and calendars. There are a bunch of time management strategies you can use (and I have already talked about them here and here). But if you notice that nothing works, you might just as well invent a new productivity technique that fits exactly to your needs and your style. Effective time management also takes a little bit of creativity, so go wild on that. 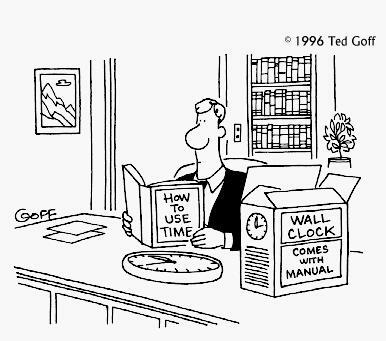 Basically, what I’m trying to say is that if you want to know how to improve time management, you’re going to need some time (Funny, huh?). And although it might seem overwhelming at times, it’s totally going to pay off. So, go ahead and make up new time management strategies and let us know how it went.